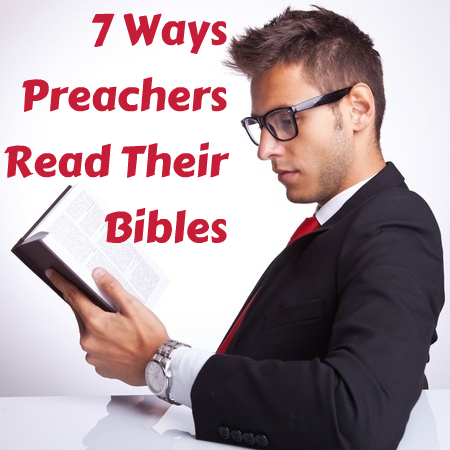 Preachers tend to read the Bible like preachers. We can’t help it. But this is neither automatically good nor bad, it all depends what we mean. 1. Always look for a sermon when you read. Some texts are easily preachable, others more challenging for sermon construction. Don’t settle for an outline or struggle for an outline, read the text and look for what it is saying to you about God. 2. Always look for the sake of others, but not hearing the message for you first. Your listeners need you to be hearing and responding to God in your life, not just hunting on their behalf. 3. Always force the text into some sort of sermonic shape – i.e. looking for the “third point” when the passage may not be structured that way. 4. Always expect the Bible to communicate because God is a great communicator. Don’t quit trying to make sense of it just because it isn’t immediately obvious. Trust that God knew what He was doing and that studying the text will be worth any effort involved. 5. Always anticipate inherent unity in a passage, rather than chasing down every tangent that the details might bring to light. 6. Always look for order and progression in the text to see how the author develops his thoughts. Is he explaining, proving, applying, or moving onto a new, but connected thought? 7. Always be sensitive to the author’s intent and tone, as well as his content and structure. He was writing for a particular audience and wrote in a loving way for their sake. Don’t treat the Bible as mere data, but as heartfelt communication. If you are a preacher, then hopefully you read your Bible. When you do, you will read it like a preacher, but be sure to make that a positive thing! This is really helpful – I think to be able to communicate your own experience with God in a passage speaks volumes. I aways think its a good idea to read selfishly, that is look for application for your own life before thinking about application to the lives of those you’re preaching to.